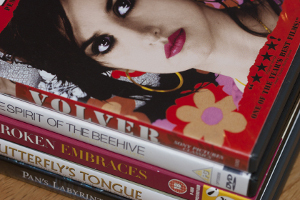 Spanish-language films are screened and commented on Saturdays from 2.30pm – 5pm and the price is £15. The whole session is conducted in Spanish, so it’s a good opportunity to practice the language while enjoying a glass of wine and some nibbles. A good knowledge of Spanish is necessary to gain full benefit from the afternoon. Screenings will start again in autumn 2016. Set in 1944 in post-Civil War Spain during the early Franquist period, when rebels still fought in the mountains against the fascist troops, young Ofelia travels with her pregnant mother Carmen to an unidentified outpost, to meet and live with her stepfather, the sadistic and cruel Falangist Captain Vidal. During the journey, a fairy tells Ofilia she is a princess and will meet her true father, the King, but only after she accomplishes three gruesome and dangerous tasks. The plot of this film has been described as “a little girl escaping the harsh reality that surrounds her by retreating into a fantasy world” although I believe the film is so much more than that: full of symbolism and hidden meaning… Will we be able to unravel it?